RQ2 - Across subject domains what do teachers’ intended and enacted pedagogic practices indicate about their awareness of and the value accorded to pupils’ digital competencies, and how do pupils’ experience these pedagogic practices? and giving children control to decide, without having to ask permission, when and how to use mobile devices. In almost all instances within the study schools the way in which ICT use was implemented meant that any potential alignment with children’s digital practise outside school was not achieved. Children didn’t feel that their out of school digital practices were relevant in school (except in relation to homework, where they often had a greater degree of agency). This lack of alignment between teachers’ pedagogical practices and children’s digital practices outside schools seems at least in part to be related to constraints that teachers have to work within (which are examined more closely in response to RQ3). Thus, for example, the purposes underpinning ICT use in school were almost always the school’s or teacher’s purposes rather than the children’s. In addition, children’s digital practices outside school developed over a prolonged period of time, and progressing from Marginal to Engaged on the Digital Practice Framework (DPF) involved sustained and increasing participation with others who shared similar interests. This was seldom the case in schools, where activities tended to be short term and isolated (even where intended to be linked by an overarching theme or topic). See Section 7 of the meta-analysis report for a fuller discussion of the findings in relation to RQ2. Despite this lack of alignment between teachers’ pedagogic practices with ICT and children’s digital practices outside school there were many examples of effective use of ICT in the study schools. A further analysis was carried out using the ICT Innovation Framework (an updated version of the Computer Practice Framework (Twining 2002a, 2002b, 2004, 2008)). Figure 11.3.1 provides an overview of the ICT Innovation Framework (ICTIF). Find out more about the ICTIF. 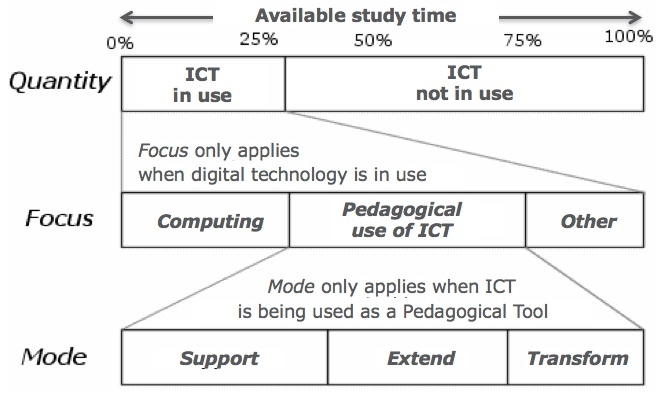 See Section 8.2 of the meta-analysis report for examples of ICT use in the study schools that did, or had the potential to, change what and/or how the children were taught and could not realistically have been achieved without ICT.